Every Monday evening an orderly queue of boys and girls would form outside the Gladstone Memorial Hall adjacent to Dalmarnock Congregational Church in Fairbairn Street. 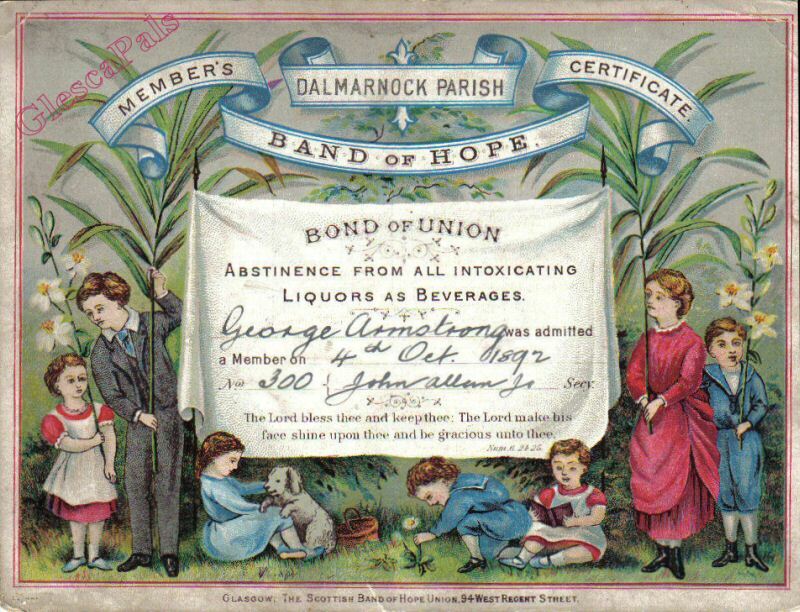 The Band of Hope, to give it its proper name, was a body of volunteers dedicated to instilling in the minds of its young members a set of high moral values to take with them through life, based, as a first principle, on a total abstinence from strong drink. The meeting began by the boys and girls reciting the Pledge in unison, led by Mr. Whiteside. There followed an evening of entertainment provided by singers and dancers from various local church groups. Our Band of Hope had its own harmonica band led by Mr.Hastie. It was really very good, and gave concerts at many social functions in the East End. in a public house, in a public house. You'll never find me there, in a public house. Working man on way home from work with his wages is persuaded, reluctantly, by his mates to join them for a drink in a public house. In time the poor soul becomes a complete slave to the demon drink, in the process depriving his wife and family of the bare necessities of life. In one slide he is seen stealing pennies from the wee bairn's piggy bank. All ends happily however, when he is met outside the pub one night by an officer of the Salvation Army who leads him back to the path of righteousness and restores him, sober and re-invigorated, to the bosom of his family. The story was told in a series of slides flashed on the screen with a running commentary by a gentleman on stage, while the lantern was operated by his assistant at the rear. The commentator, in telling the story, used a "clicker" to signal to his assistant when to change slides. Invariably, some "wise guy" in the audience would have a "clicker" of his own, which he would click at random, seeking thereby to confound the whole operation and hoping, no doubt, to throw the audience into fits of laughter. It never worked. Both operators had been telling the same story at Band of Hope meetings for years, and were not fooled by the ruse. A warning by Mr. Whiteside to the miscreant to cease and desist was generally sufficient. I don't think the Band of Hope survived the war, but after almost 70 years, I still remember the Pledge. Remembering the words is one thing, but fulfilling its premise - Well that, as they say, is another story. Feb 2003, Jimmy Reid, Canada. Band of Hope/Gospel Hall Singers' no matter what you call them, they were a great bunch of folk. I never seen my Ma' or Da' get up aff the chair on a cauld night tae pit oan a wee singsong furr the wains. A cup of tea and a Paris bun were 'Magic' to us in those days. fur her birthday every year an' oor gang hut wis well lit wi' they lovely big candles, bit, ah' nivir took ony money. I always thought it wis awright tae take stuff ye needed, but, tae take money??? that made ye' a thief!!! (Must jist be proddy thinking???) It wis the same at The Orange Walk!! me an' ma' pals used tae swagger and dance aw' ower the road tae the music an' hud a rerr time. Ah' wunner if we "played wi' thae Cafflicks" or dated somebody from the other religion, BECAUSE! oor parents told us not too??? Ah' wunder if we've learnt from oor pasts tae be a wee bit mair tolerant of ither sorts??? Well!! ah' merritt two Catholics and two Proddy's an' drink wis the problem! no religion! God Bless ye' an' yurr wee site!!! Thanks for the memories, Peter. If you’ll excuse someone intruding who is not a proud “Bridgetonian” but remembers well the old Band of Hope. My memories of both Bridgeton and the Band of Hope remain. My first experience in or near Bridgeton was as a lad travelling east on the London Road and past Bridgeton Cross by tramcar to visit my Aunt Cathy in Auchenshuggle during the War. She lived in a new prefab near the cemetery and she and my uncle Jimmy got their cozy we house after they were bombed out of their tenement flat on North Frederick Street, just up the hill from George Square. The street no longer exists. Later as a teenager I recall taking the tram on those “dead” Sundays in Cathcart on Glasgow’s South Side, and riding into Central Glasgow, then changing trams at Argyle Street and continuing along London Road. Finally getting off at a wee hole in the wall record shop that specialized in great jazz records. It was for me sheer paradise to be able to listen to those 78-RPM vinyl records (one tune on each side – remember?). The storeowner would play a few before I would finally choose which one to buy. Then I’d pay out my hard earned cash - six and sixpence - and return home along London Road to enjoy those 78’s endlessly at home on our old wind-up gramophone with the latest needle pickup amplified through my Dad’s new hi-fi speakers. Stan Kenton, and other great American bands I remember, and it was Bridgeton that offered an escape with its wee record store. Thanks Bridgeton. Later in my early twenties and fresh out the army after my national service I often travelled to Barrowland to enjoy the dancing and the great bands that played there. The jitter bugging girls and guys could have danced the socks of Fred Astaire. It was always a mystery how those guys could dance with those drainpipe pants and thick crepe soled shoes. I never did ask for a lumber at Barrowland because you never knew if the girl was some local gang member’s girlfriend. One night while walking along the London Road after hearing the great Johnny Dankworth band, a fellow came running past me with a gang in hot pursuit. I saw the terror on his face and chains in their hands as they flew by me. Fortunately, he just managed to jump onto the platform of a passing tramcar heading for Tollcross and escaped. That was the other side of Bridgeton. So what does all this have to do with the Band of Hope? Well, you see Bridgeton was not the only place where Band of Hope nights were held. 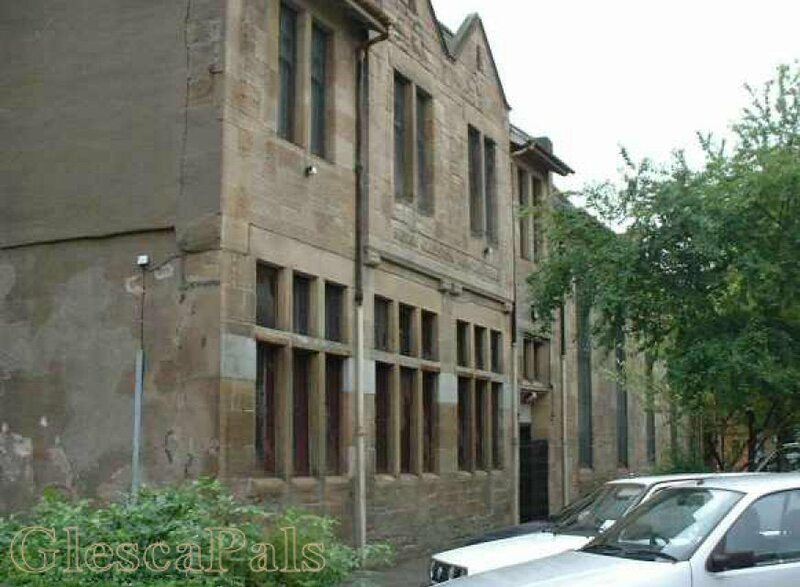 In the Church of Scotland hall in Cathcart we boys used to attend weekly meetings. There we got arts and crafts and games followed by the lantern show. I can remember the heat and smell of the lantern, which often projected pictures of darkest Africa and the works of missionaries there. I don’t so much remember that much talk about demon alcohol as Peter Scott recalls in Bridgeton. But maybe that’s because Cathcart boasted of being a “Dry” district. Not a pub to wet the whistle for miles, until you reached Queen’s Park. After being discharged from the regular army I reported back to 3O Armored Workshop in Bridgeton at Greendyke Street and the REME territorial regiment located there. I don’t know if the armory still stands there today. And what about the Bridgeton and Band of Hope connection? Well, there was also another Band of Hope at the old Tent Hall in Bridgeton and someone wondered if it had survived after WW II. Well, yes it did, because my wife and I attended Bible classes there in 1955 just after the All Scotland Billy Graham Crusade and just months before our immigration to Canada. My tale is a poor substitute for the marvelous stories of those who lived and grew up in Bridgeton. The hardships and the heartfelt stories that can make us laugh and make us cry. But it speaks of an era that I believe shaped a whole generation and made us the better for it. I would hope that some folks reading the great stories and pictures that come out of Bridgeton might also know how and where a similar web site of Cathcart pictures and stories might be found. Please let us know. Meantime I love every new story, picture and memory that comes out of Bridgeton and Glesca Pals. Thanks for sharing it. It’s a people’s history that should not be forgotten. Keep it up. I'm glad you enjoyed my rambling memories. However, my true brig'ton authenticity has been questioned by a genuine member of that renowned group of "Bridgetonians" here in Vancouver and besides, my toffee-nosed Cathcart accent gives the whole show away. Anyway, the gig is up. Joe has said that I don't even know where Bridgeton begins and ends. He's got that right. My description of the armories on Greendyke Street and the Band of Hope being located in the Tent Hall, round the corner, was a dead give-away. Joe says, that these premises were actually in Calton and not Bridgeton. Now I've probably got those Calton people mad also for omitting that critical information. I knew Auchenshuggle was outside the Bridgeton boundry so I got that right, I think. Afterall, I was just a lad then and have some excuse if my geography is a bit skewed. Aug.2005 Grandfather's certificate from Dalmarnock Parish Church from Jim Armstrong, Antrim, N.I. Hope you all enjoyed these stories and a big thanks to the gentlemen for sending them to me .....Its one of the many pleasures of my website work being able to provide this medium to print these memories for posterity..... webmaister. 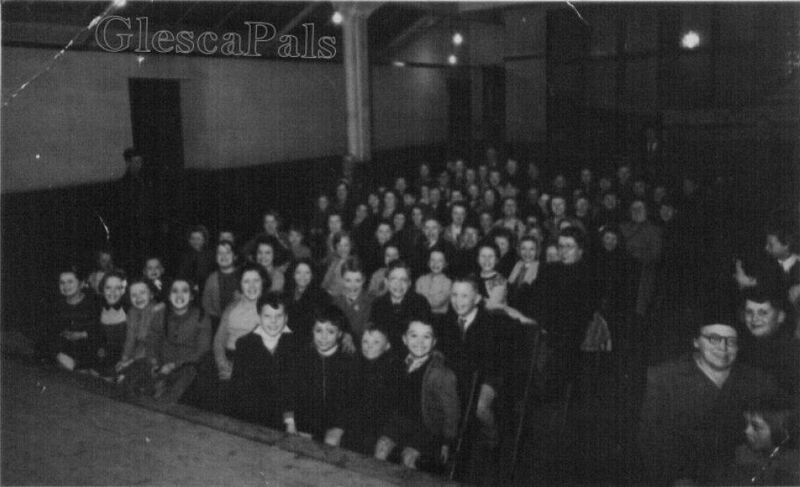 I've sent a photograph taken circa 1953/54 in the church hall of the Hall Memorial Church, Dalmarnock. It shows a well-attended Band of Hope meeting which was held every Monday night and was led by James (Jimmy) Freer, Firewood Merchant, Mauldslie Street, Bridgeton. That's me, 'Glesca Artist' sitting in the front row next tae the aisle wi' his wee brother, GlescaPal Eddie, sitting next tae him. We would sing choruses like "Deep and Wide" and "Running Over", listen to bible stories from guest visitors, and watch slide projector shows, mainly about the bible. On special occasions we would have a party when a goody bag containing sausage rolls, sandwiches and cakes would be handed out with a cup of tea as we watched and thoroughly enjoyed Charlie Chaplin films. I lived opposite Freer's yard in Barrowfield and spent a lot of time in there, my mum and sister were good friends of his as were a lot of people in Barrowfield st. I used to go to his Christmas parties he had in his house when I was a little girl. I remember one time he had a lot of chickens that they plucked there was feathers every where and I mean a lot, I dont know what they were for, he also had the American 'band of hope' people stay at his place.